BicPAMS is a powerful and flexible tool for the exploratory and unsupervised analysis of tabular and network data. BicPAMS integrates state-of-the-art contributions on pattern-based biclustering (including BicPAM, BicNET, BicSPAM, BiC2PAM, BiP, DeBi and BiModule). As such, BicPAMS is able to efficiently discover exhaustive and flexible structures of biclusters, with parameterizable coherency and robustness to noise and missings. BicPAMS has been successfully tested on biomedical data (including expression data, clinical data and biological networks) and social data. For previous versions of the BicPAMS software please contact the authors. 2017/01/11: The software article describing the BicPAMS software was published in BMC Bioinformatics. 2017/01/11: Methods to assess the statistical significance of biclusters (BSig) were added to the source code (soon available in BicPAMS GUI). 2016/12/08: A stable version of the software (GUI, API, console and source code) was uploaded. 2015/11/21: Desktop graphical interface of BicPAMS was released. 2015/10/27: A stable version of the programmatic interface of BicPAMS was released. This interface consistently combines the behavior of BicNET, BicPAM, BicSPAM, BiP and BiC2PAM. 2014/09/17: A stable version of BicNET was released for biclustering network data in order to retrieve non-trivial yet meaningful modules. 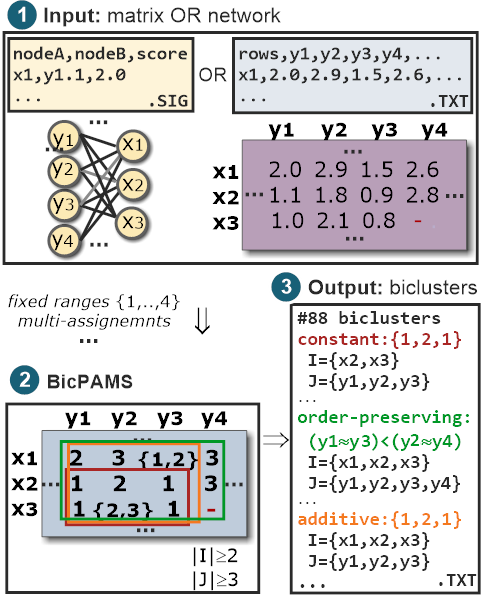 2014/01/21: A stable version of BiC2PAM was released for constraint-based biclustering in the presence of background knowledge. 2013/07/20: A stable version of BiP was released for biclustering data with plaid effects. 2012/06/13: A stable version of BicSPAM was released for flexible and robust order-preserving biclustering. 2012/04/21: A stable version of BicPAM was released for flexible and robust biclustering with constant, additive, multiplicative and symmetric coherency assumptions. BicPAMS software is made solely available for research and educational purposes. In this context, you can use the software under: 1) the terms of the GNU General Public License as published by the Free Software Foundation (either version 3 or any later version), and 2) its proper citation. BicPAMS is distributed in the hope that it will be useful, but WITHOUT ANY WARRANTY (without even the implied warranty of MERCHANTABILITY or FITNESS FOR A PARTICULAR PURPOSE). If you wish to use it for other purposes, you must contact the authors for permission. In the figure on the left, BicPAMS is applied over an illustrative dataset (either in network or matrix format). The outputted biclusters when considering different coherency assumptions are shown in textual format. For this analysis, we assumed fixed discretization ranges (with 4 items) and the assignment of multi-items to guarantee an adequate tolerance to noise. The remaining parameters were set as default. For a more detailed compilation of testing cases, please access the Case Tests tab (where we provide synthetic and real data, suggest parameterizations and briefly analyze the ouputs). For both testing purposes and becoming familiar with the potentialities of BicPAMS, we make available the following 10 testing scenarios. We also suggest the introductory video made available in the tutorial page. If you want to see how BicPAMS performs against alternative biclustering algorithms please consult the previously published articles. Note: for benchmark synthetic datasets with varying size and planted biclustering solutions with varying structure, coherency and quality please visit the BicPAM, BicSPAM, BiP and BicNET webpages. The BicPAMS team appreciates your suggestions and the reporting of any problem that you may be able to detect. Rui Henriques (responsible) received his PhD in the field of machine learning from high-dimensional and structured data by IST, University of Lisbon and Inesc-ID. He received distinctions for his academic achievements between 2006 and 2010 by University of Lisbon and Caixa Geral de Depositos, and honors for his research by IST in 2016. He has also been a business analyst at McKinsey with wide exposure to real-life projects. Francisco L. Ferreira (interface developer) received a MSc degree in Biomedical Engineering at IST, University of Lisbon, in 2013. Following that, he worked as a software developer at Novabase and as a process analyst at Espirito Santo Saude. In 2015, he decided to pursue his interests in machine learning, networks and bioinformatics and started doing research with Professor Sara C. Madeira at Inesc-ID. He is currently doing his PhD in Biomedical Engineering at IST. Sara C. Madeira (supervision) received a (5-year) BSc degree in computer science from the University of Beira Interior and the MSc and PhD degree in computer science and engineering at IST, University of Lisbon in 2002 and 2008. She is currently an Assistant Professor, at the CSE department at IST, and a senior researcher at Inesc-ID. Her research interests include algorithms and data structures, data mining, machine learning, bioinformatics and medical informatics.